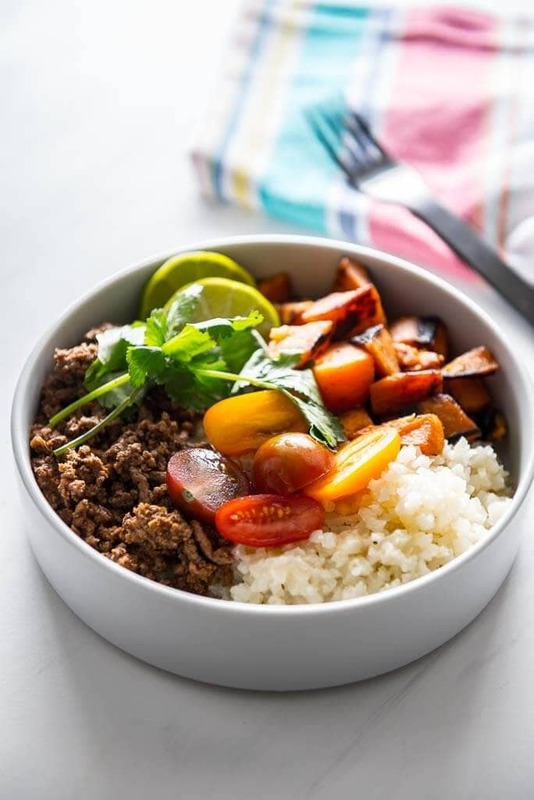 When you need a quick and easy dinner that’s totally customizable for each member of the family, how about this Quick & Easy Healthy Taco Bowl? Full of delicious flavors and quick to throw together when you’re rushed to make dinner! Who doesn’t love a good meal in a bowl? Customizable to every member of the family, easy to assemble and full of delicious things! 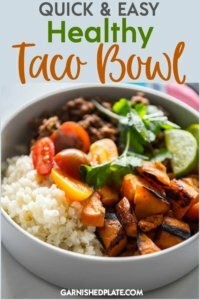 I personally love these taco bowls because I can add more veggies to my liking, my kids can top theirs with plenty of cheese and my husband can fill his up with meat and sour cream and we can all be happy at dinner time. 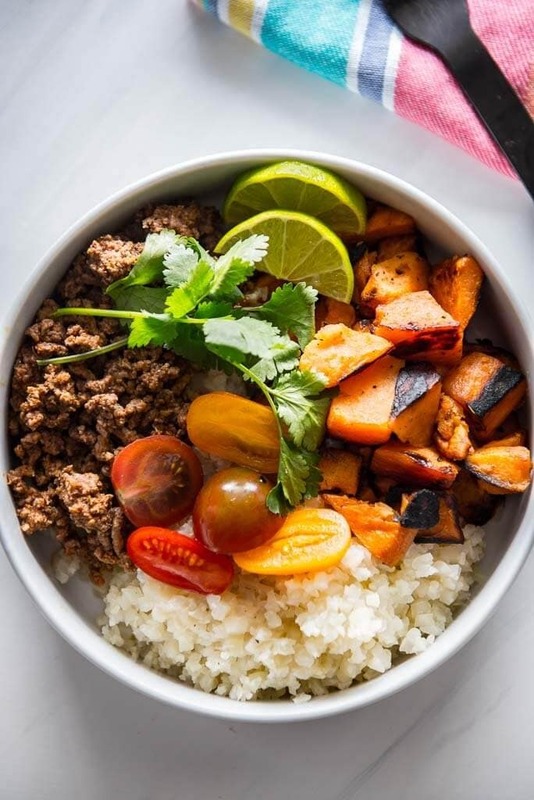 These Quick & Easy Healthy Taco Bowls use my homemade taco seasoning for amazing flavor that you can always have on hand as well as frozen potatoes and cauliflower rice for quick prep. How to make taco bowls healthier? instead of regular rice, use cauliflower rice! 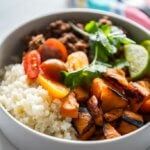 I actually prefer the texture and flavor of cauliflower rice these days! What if I don’t have any taco seasoning? no worries! 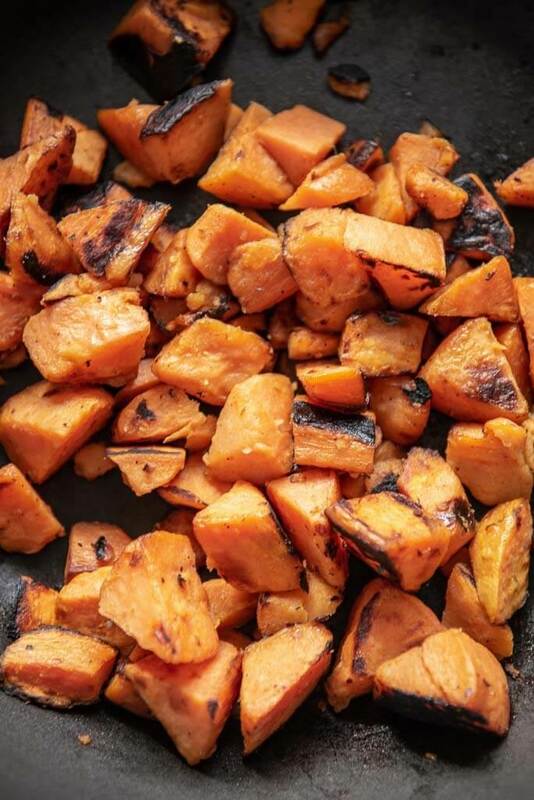 My homemade version is even tastier and chances are you have the ingredients in your pantry! you could mix up the flavors any way you want to try new bowl combos! Think fajita, herb and garlic, the options are really endless! What if my kids won’t eat the veggies? Set all the veggies out buffet style and let the kids make their own bowls. They may be more likely to try them if they make the bowls themselves. Add some veggies you know they will eat, even if its something like corn along with the other veggies. The more times you offer it, the more likely they are to try. 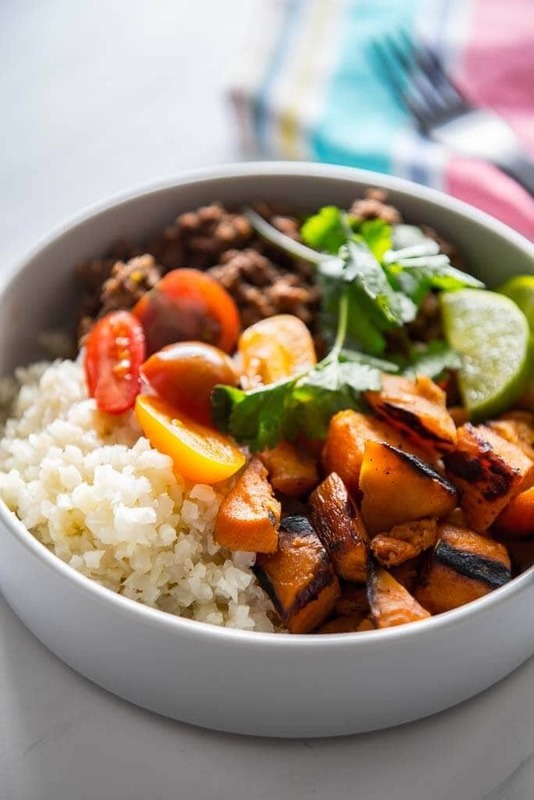 When you need a quick and easy dinner that's totally customizable for each member of the family, how about this Quick and Easy Healthy Taco Bowl? Full of delicious flavors and quick to throw together when you're rushed to make dinner! This hamburger meat chopper is one of my favorite kitchen tools for making perfectly browned ground beef! These recipes look like they will be perfect! One thing: is there a cost for this site? Hi Elizabeth and thanks! There is only a charge if you sign up for my meal plan service. There you get extra recipes and custom meal plans each week!! But blog recipes are always free! Let me know if you have questions! Love how healthy this is! I'm making this for sure!